We’ve moved. Downsized. Empty-nested. All at once. Of necessity and by design, since we moved into a narrow rowhouse from the turn of that other century, many things that had followed us relentlessly, like puppies or perhaps more like bedbugs, had to be left behind. This included furniture we never loved nor wanted, supposed “heirlooms” that had simply once belonged to some aunt that were cheap furniture even when purchased and were mostly useless even in our old house, which had some room for nonsense. The new house can brook no nonsense. But not all sentimentality can be surrendered, and so there’s this thing. This window. It came from the house I grew up in, in Scotia. Actually a perfectly ordinary window for its time, in a pretty ordinary house that was built somewhere around 1910, if I recall correctly. It was at the landing where the stairs curved. When I was growing up, ours was a two-family house; our apartment was downstairs, and “the lady upstairs,” as we always referred to her, lived, well, upstairs. And this window let colored light into the stairwell, and made the old gray house look a little bit more colorful from outside. At some point, in one of her endless renovations to the house, my mother decided this window had to be replaced, but she had the foresight to ask me if I was interested in it. My wife had a mirror put in the middle and gave it to me as a gift, and it hung in our house in East Greenbush for most of the 23 years that we lived there. 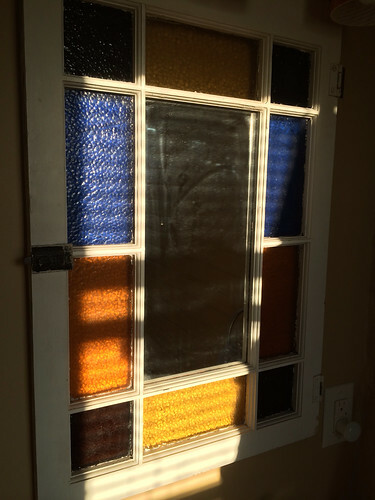 And when I saw the perfect little half-bath in our new house, with a brick wall and a heavy dose of morning light, I knew the old window from Scotia simply had to find a new home here in Phoenixville. So even in this current mood of blowing up everything and letting go of the past, some of the more important parts still have to stay with us. O the things you will do!